As any voracious reader knows, there are so many books out there, it can be hard to choose just what to read next. So what could be better than a hand-picked recommendation from someone in the know? Every Wednesday the XOXOAD team likes to find out what some of its favorite authors are reading. 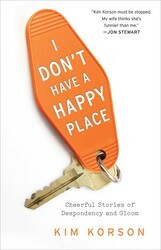 To that end, we’ve asked the ever-chipper Kim Korson, author of I Don’t Have a Happy Place, to tell us what she’s been burying her nose in these days! I just started Unabrow: Misadventures of a Late Bloomer by Una Lamarche. I am only on page two and already in love. I’m obsessed with humorous writers, especially when they’re as witty, dorky, and intelligent as Lamarche. It’s the kind of book where you feel like you’re hanging out with your best friend, and every line makes you nod your head in recognition. The reading is easy, which I know from experience, makes for some difficult writing. I already feel like locking my family in a closet so I can finish. Since I often am reading a few books at once, I have also started Euphoria by Lily King. The press has fallen head over heels for it, and I wanted to see what all the hubbub was about. It’s a fictionalized account of events in the life of legendary anthropologist Margaret Mead. There is promise of love triangles and intellectual stimulation, and they say you don’t even need to know a thing about Mead or anthropology, which, I am proud to report, I don’t! I’m already seduced by her spare, poetic writing style (but the good kind of poetic, the kind I understand) and am ready to embark on this journey, eager to see where she leads me. And, not for nothing, the actual pages themselves are really nice. The Unspeakable by Meghan Daum has taken up residence on my desk and every time I procrastinate my own work, I pick up hers. Maybe, if I keep it close enough to my computer, some of her talent will noodle its way into my machine. Or my brain. Or anywhere near me. Daum is a master. The first essay, “Matricide,” which recounts the death of her mother, is so honest and biting and lovely, I almost wanted to stop there because I wasn’t sure anything could top it. Keep going, they’re all this good. I bought this next book for its fantastic cover, title, and intriguing reviews. It’s called The Sasquatch Hunter’s Almanac by Sharma Shields. I have no idea what to make of this book that is about a 9 year old who watches his unhappy mother walk off into the woods with someone named Mr. Katz who may or may not be a sasquatch. I have no idea what to make of this but I already want to know what happens. As a child, I was terrified that Bigfoot was coming to get me. Let’s see what he’s all about. I’m thrilled that my 10-year old daughter is an avid reader, and like many pre-teens, intrigued by older-than-herself characters and subject matter. She really wants to get her hands on I’ll Give You the Sun by Jandy Nelson, so I’m vetting it first. There are twins and crushes and events to change lives and apparently some pretty cool structural devices—I might start this one right now. I should also note I really like the cover and the author’s name. I find these things very important. I’m very pleased with this week’s reading list. And by the fact that the Goya black beans were on sale. Now get reading. Meghan Daum returns to the personal essay with a masterful collection of new, previously unpublished work. The New York Times Bestselling story of first love, family, loss, and betrayal for fans of John Green, David Levithan, and Rainbow Rowell.